This section provides an overview of the SPARC hypervisor, which supports logical domains. The SPARC hypervisor is a small firmware layer that provides a stable virtualized machine architecture to which an operating system can be written. SPARC servers that use the hypervisor provide hardware features to support the hypervisor's control over a logical operating system's activities. A logical domain is a virtual machine comprised of a discrete logical grouping of resources. A logical domain has its own operating system and identity within a single computer system. Each logical domain can be created, destroyed, reconfigured, and rebooted independently, without requiring you to perform a power cycle of the server. You can run a variety of applications software in different logical domains and keep them independent for performance and security purposes. The number and capabilities of each logical domain that a specific SPARC hypervisor supports are server-dependent features. The hypervisor can allocate subsets of the overall CPU, memory, and I/O resources of a server to a given logical domain. This capability enables support of multiple operating systems simultaneously, each within its own logical domain. Resources can be rearranged between separate logical domains with an arbitrary granularity. For example, CPUs are assignable to a logical domain with the granularity of a CPU thread. Each logical domain can be stopped, started, and rebooted independently of each other without requiring you to perform a power cycle of the server. 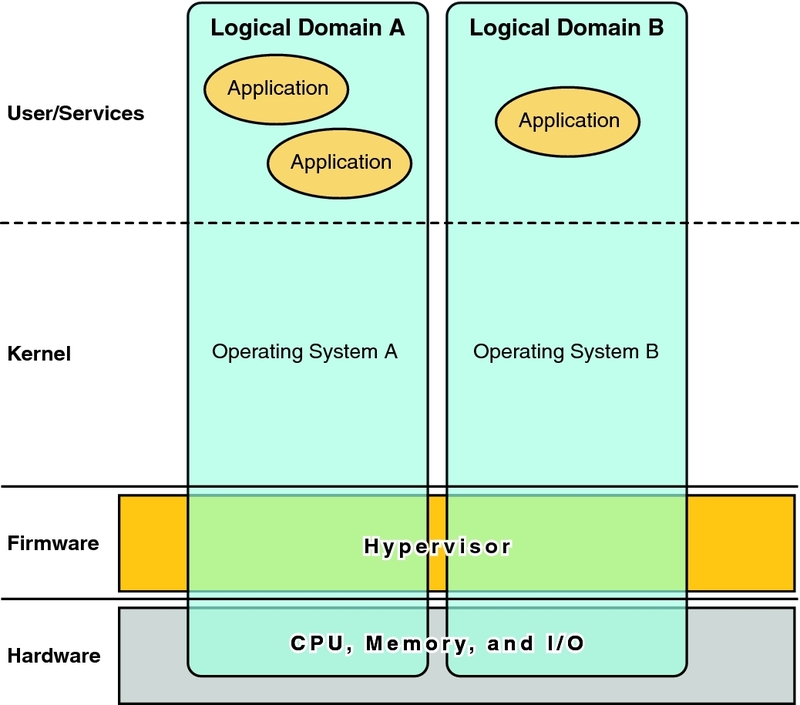 The hypervisor software is responsible for maintaining the separation between logical domains. The hypervisor software also provides logical domain channels (LDCs) that enable logical domains to communicate with each other. LDCs enable domains to provide services to each other, such as networking or disk services. The service processor (SP), also known as the system controller (SC), monitors and runs the physical machine, but it does not manage the logical domains. The Logical Domains Manager manages the logical domains. In addition to using the ldm command to manage the Oracle VM Server for SPARC software, you can now use Oracle VM Manager. Oracle VM Manager is a web-based user interface that you can use to manage the Oracle VM environment. Earlier versions of this user interface only managed the Oracle VM Server x86 software, but starting with Oracle VM Manager 3.2 and Oracle VM Server for SPARC 3.0, you can also manage the Oracle VM Server for SPARC software. For more information about Oracle VM Manager, see Oracle VM Documentation (http://www.oracle.com/technetwork/documentation/vm-096300.html).